What is the Tessel 2? OK, So What's a Development Board? Development boards are platforms for prototyping and building embedded systems. At the heart of (most) development boards is a microcontroller, which combines a processor and memory with I/O capabilities. 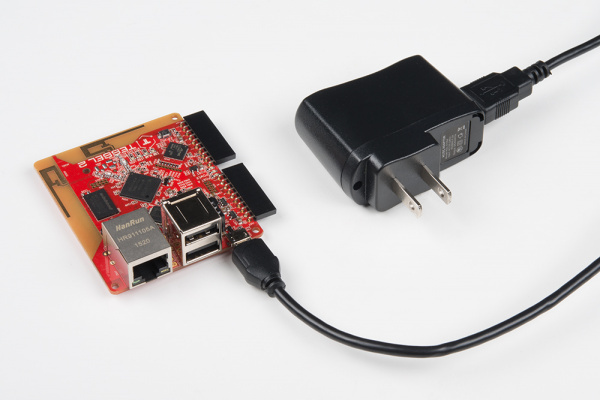 Microcontrollers like the one on the Tessel 2 provide a collection of GPIO (General Purpose Input Output) pins for connecting input and output devices. The pins on the microcontroller itself — a chip — are small, too small for human fingers to work with easily (plus you'd need to solder things to them). Instead, development boards connect these GPIO pins to pin sockets that are easy to plug things into. Other common features of boards play a supporting role: connections for programming and communicating with the board, status lights, reset buttons and power connections. 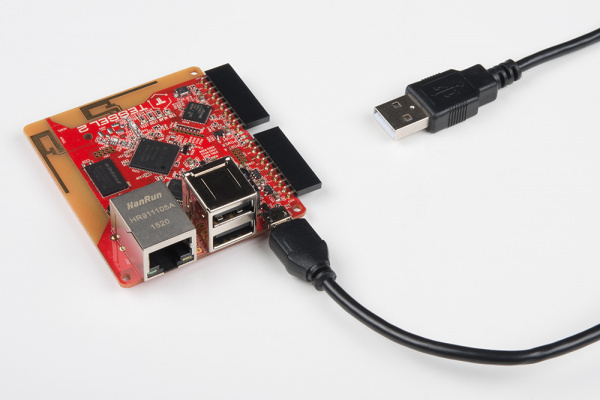 Powerful boards like the Raspberry Pi and Tessel are sometimes also called Single-Board Computers (SBCs). Tessel has a set of Command Line Interface (CLI) tools for setting up and working with the Tessel 2 board. You'll install these and do a one-time setup provisioning of your Tessel. There are two primary sets of pins on the Tessel 2: Port "A" and Port "B". Each port has 10 pins: two for power (3.3V and ground) and eight GPIO pins. Some pins support different features, which are covered in the next section. There are multiple ways to power the Tessel 2. We'll start by using the included USB cable. Connecting to the board directly with USB will allow you to easily modify any circuits and redeploy code from the comfort of your desk, without having to retrieve your project. This is also handy when you don't have access to the local network (for deploying code over WiFi). Once you have completely set up and provisioned your Tessel 2, you can deploy code through your local WiFi network. At some point you'll itch to make your Tessel free of wires and tethering, but it still needs power. We supplied a 5V USB charger in the Johnny-Five Inventor's Kit (J5IK) so you can place your project in a semi-remote location around your home or office and deploy code from anywhere on your local network. USB battery packs are becoming quite popular as swag and giveaways at events. We collect them like candy because they allow us to power projects with minimal consideration to power management circuitry. If you have one of these handy, just use the included USB cable to plug the Tessel 2 into your battery, and away you go! That's it -- simple as pie. 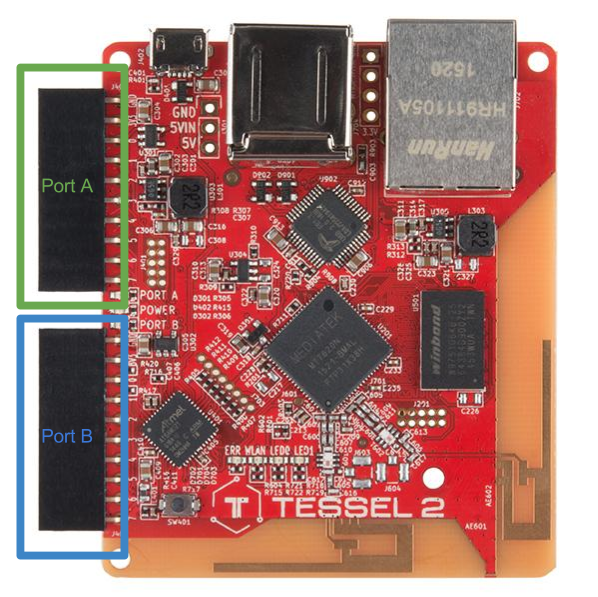 The Tessel 2 has two IO modules, Port A and Port B. Each port has 8 GPIO (general-purpose I/O) pins. Here's their naming conventions and what all of them do. The pins on the Tessel 2 are broken out across the two different ports. The naming conventions in code will be referenced with the port letter first and then the pin number of that port. The port letter is not case sensitive! As an example, the first pin on port A would be referred to as pin a0 or A0. Use this table as a reference in terms of the naming of pins. A 0 "a0" or "A0"
A 1 "a1" or "A1"
A 2 "a2" or "A2"
A 3 "a3" or "A3"
A 4 "a4" or "A4"
A 5 "a5" or "A5"
A 6 "a6" or "A6"
A 7 "a7" or "A7"
B 0 "b0" or "B0"
B 1 "b1" or "B1"
B 2 "b2" or "B2"
B 3 "b3" or "B3"
B 4 "b4" or "B4"
B 5 "b5" or "B5"
B 6 "b6" or "B6"
B 7 "b7" or "B7"
The pins of each port have different functionalities available to them. All eight numbered pins, both ports (16 total), can be used as GPIO. Pins 4 and 7 on Port A support analog-to-digital input. All pins on Port B support analog input. Pins 5 and 6 on both ports support Pulse-Width Modulation (PWM). Pins 0 and 1 on both ports can be used for I2C serial communication. Serial TX/RX (hardware UART) is available on both port, pins 5 (TX) and 6 (RX). Port B: All numbered pins can be used for analog input. Port B, Pin 7: Supports DAC. Working with the Tessel is just like doing web development. But if you're not familiar with web development, you might want to take a minute or two to get comfortable with some key tools of the trade: the command line, which is the "terminal" where you execute commands, and the text editor, where you work on and save your programs. Tessel's site has a great resource to help you get started with terminal. You'll see this when you get to the first experiment. But, don't skip ahead; you'll need the tools we install in the next step. Take a moment to set up a working area (directory) where you can put the programs for your Johnny-Five Inventor's Kit (J5IK). You'll also need to initialize the new project with npm and install needed npm modules for both Johnny-Five and Tessel. Running these commands will generate some output in your terminal. If everything goes smoothly, you'll see some output about edits to a package.json file, and some additional output as npm installs the needed modules. You may also see a few WARN statements about missing description or repository field. Don't worry; nothing's broken. If you are making a global installation on a Linux computer, be sure to add sudo in front of your npm installation command! Some Linux distributions require a few more library installs for `t2-cli` to work! Please install the libraries with the following command: apt-get install libusb-1.0-0-dev libudev-dev. You can find further documentation here. You interact with the Tessel 2 using a Command Line Interface (CLI) tool called t2-cli. This tool can be installed using npm (the Node.js package manager, which gets installed automatically with Node.js). The -g piece of that command (a flag) is important; this will tell npm to install the package globally, not just in the current project or directory. You're aiming for the LTS (Long-Term Support) version of Node.js, which at time of writing is v4.4.5. Learn more about how to upgrade and manage node versions with nvm. Now, time to get your hands dirty and get things up and running! Connect your Tessel 2 to your computer and give it about 30 seconds to boot up. Success! You can now communicate with your Tessel 2! If you've ever configured and connected other embedded systems to the internet, the simplicity of this should make you grin. Replace [SSID] with the name of your wireless network (careful, it's case-sensitive!) and [password] (well, I bet you can figure that out!). That's it -- simple as pie! You can do a bunch of other stuff with your Tessel and network connectivity. Tessel's website has in-depth documentation on WiFi connection options. Note: Like Kindles and some Androids, Tessel 2s don't play nice with 5GHz WiFi networks. Your Tessel exists, has a name, and is connected to your WiFi network. The next step is to provision the Tessel. That creates a secure, trusted connection between your computer and the Tessel, whether it's connected by wire or over the air (WiFi). You'll need to do this before you can deploy code to the Tessel. You'll see your Tessel twice! That's because it's connected via USB and WiFi. Great! We have one last setup step. The update process can last some time, so I would recommend a snack break or checking up on some news feeds while this happens. When the update is finished you will get the command prompt back, and you are all ready to go with your Tessel 2! Making an LED (Light-Emitting Diode) blink is the most basic "Hello, World!" exercise for hardware, and is a great way to familiarize yourself with a new platform. In this experiment, you'll learn how to build a basic LED circuit and use Johnny-Five with your Tessel 2 to make the LED blink and pulse. In doing so, you'll learn about digital output and Pulse Width Modulation (PWM). Perhaps you've controlled LEDs before by writing Arduino sketches (programs). Using Johnny-Five + Node.js to control hardware is a little different, and this article will illustrate some of those differences. If you're totally new to all of this — not to worry! You don't need any prior experience. To get you started, here is an example of a blink script using Node.js and Johnny-Five. 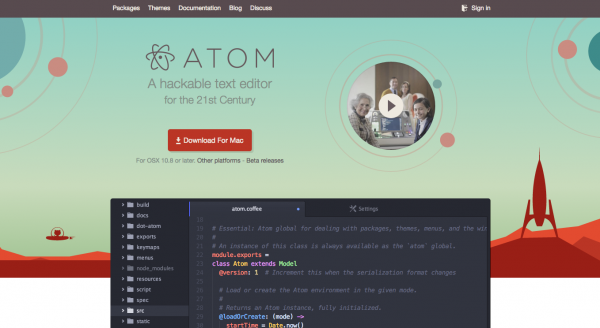 With that complete, open your favorite text editor (one choice is atom) and navigate to your blink.js file. Copy and paste the blink code above into your file and save it.